I love making resolutions. Every year, the week before New Year’s, I sit down and write out anywhere from 25-50 New Year’s Resolutions. For a lot of people, making a long list of resolutions is just asking to fail, but I honestly keep about 90% of my resolutions every year. Want to know my secret? You have to find a way for you to think about your list of resolutions every single day. For me, that’s a planner; every morning I review the goals I have set for myself and write down what I need to do that day to accomplish those goals. For someone else, that might be typing up your resolution/s on a paper and hanging it on your mirror, a checklist to have something to mark off every day saying you met your goal, etc. Whatever you can do to help yourself think about your resolutions every day, that is what you need to do to help you achieve them. Use a goal tracker. 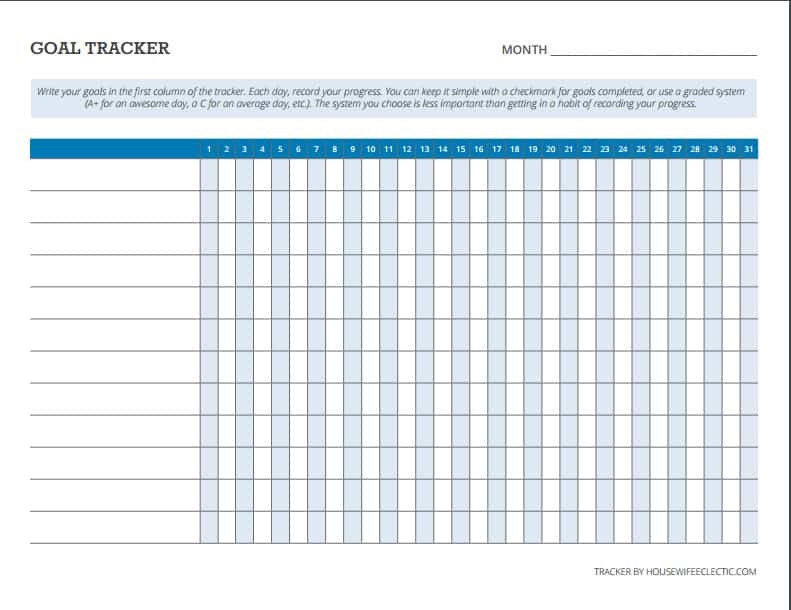 A goal tracker lets you write every goal you have for the month on the left and then check each box off on the right. This will let you see your progress on your goals at a glance and is perfect for someone who doesn’t want to use a planner. Hang this one on your mirror, your fridge, or even by your bed. Anywhere you will see it every day. You can download my free goal tracker here. Set Reminders on Your Phone. Do you want to drink more water? Go to the gym? Help yourself by setting reminders every time you need to drink another glass of water or 30 minutes before your spin class. Keep your goals and resolutions on your mind, and set alerts for when they aren’t!. Set Yourself Up For Success. If you want to lose 20 pounds this year, keeping chocolate in your dresser drawer is setting you up to fail. Clear your house of the things that reinforce your bad habits and prepare yourself to succeed. Replace your vices with something else. You can’t expect yourself to go cold turkey from diet drinks to nothing. Try a flavored water instead. Reward yourself in healthy ways. One of the biggest ways I used to fail is that every time I worked out, I would let myself have a treat. I would ruin all of my hard work with a big bowl of ice cream. Now, I drink a protein smoothie: it is chocolate and delicious without being full of the junk I am trying to get rid of. 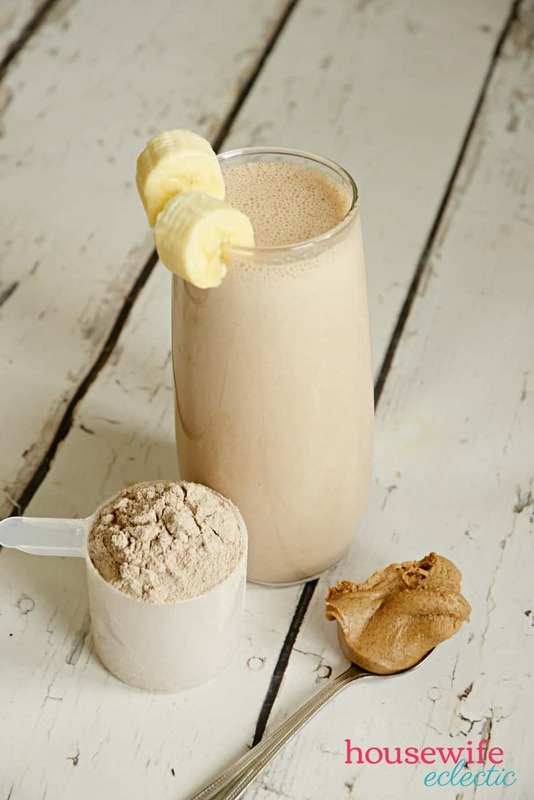 Find the recipe for one of my favorite protein shakes, a Chocolate Almond Protein Shake, below. 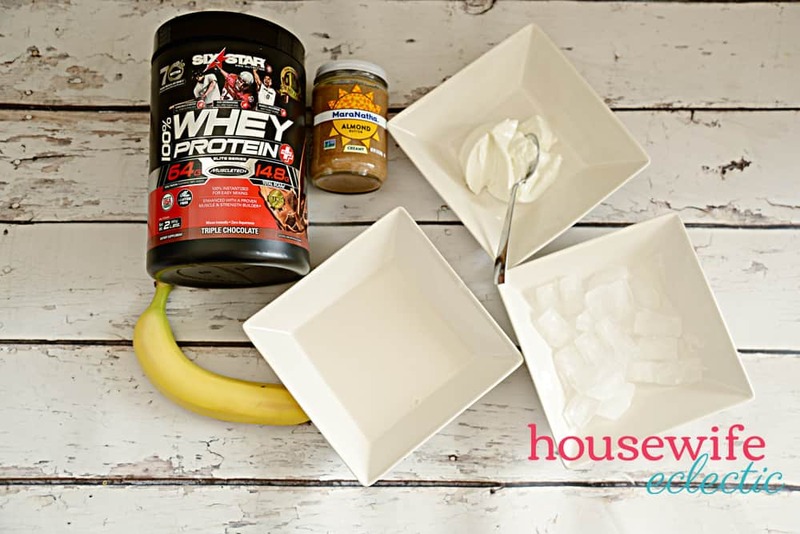 Add all of the liquids to your blender first, followed by the almond butter, banana, protein powder and ice. 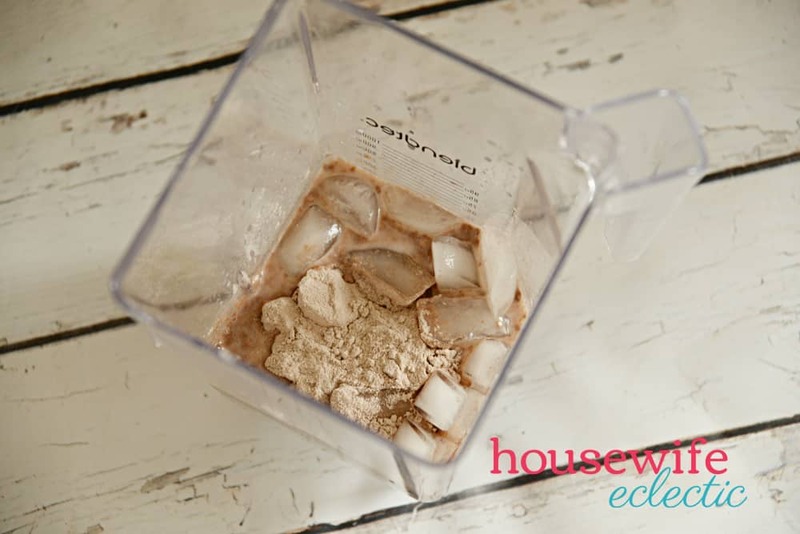 Blend on high for about 45 seconds or until smooth. I love to pour my shake into a large thermos so that I can have it with me when I run on the treadmill. It is the perfect post work out drink. Six Star is 100% Whey Protein Plus and 100% Whey Protein Plus is scientifically superior to regular protein which will help you build more muscle and increase strength. Six Star is built to help you recover from your workouts and it comes in four different flavors. Triple Chocolate, Vanilla Cream, Strawberry Smoothie and Cookies and Cream. love finding new ways to pack in more nutrition and protein in my protein shakes so I have started using Greek Yogurt and MaraNatha Almond Butter. 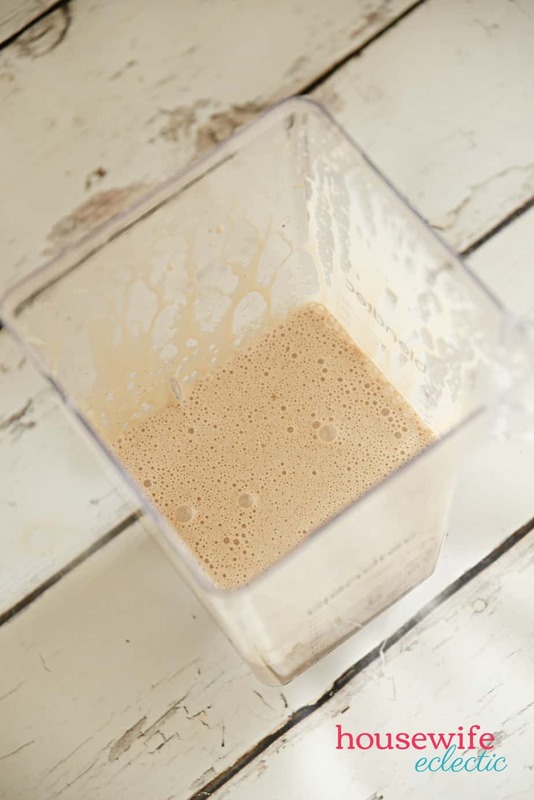 Almond Butter is a heart-healthy way to get more protein in a shake. Almonds have one of the biggest protein sources of any nut, but they have no cholesterol! Almonds are also a great source of fiber and other nutrients. I love adding almond butter to my shakes for an extra boost in protein and flavor. Protein shakes are a great thing to add to your daily regimen for anyone but I personally love using them to help me recover from my workouts and help me reach my new years resolutions. How do you keep your new years resolutions? This sounds so good! I like that it is packed with protein, it can work as a good meal option if I need something quick. Some days are just so hectic so something like this would be perfect. Also… chocolate… 🙂 Always a hit! I know for a fact that I don’t get enough protein in my diet, so this is a great way to get it in there. I will have to try this. My Mom is a big fan of protein shakes. She loves chocolate and banana so this is one I’m sure she’d be up for trying. Talk about a protein shake that I’ll enjoy! 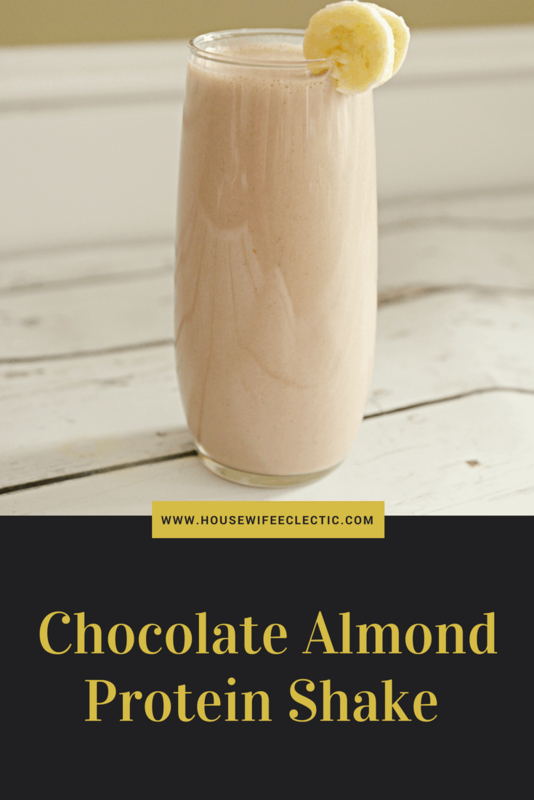 I do love chocolate and almonds and when you put it in a shake like this, I’m definitely game! Thanks for the recipe. Such a good replacement for that chocolate bar I keep munching on. I pretty much have everything in my pantry except for the protein powder, which I can easily get! This shake looks so thick and delicious. You had me at chocolate and almond. Adding the whey for protein is always beneficial. Don’t have to tell the rest of the family how healthy it is for them. Just let them drink and enjoy. This looks absolutely delicious. It’s also very easy to make! I love a good alternative for chocolate because chocolate is one tough treat to give up! This definitely is a must try. 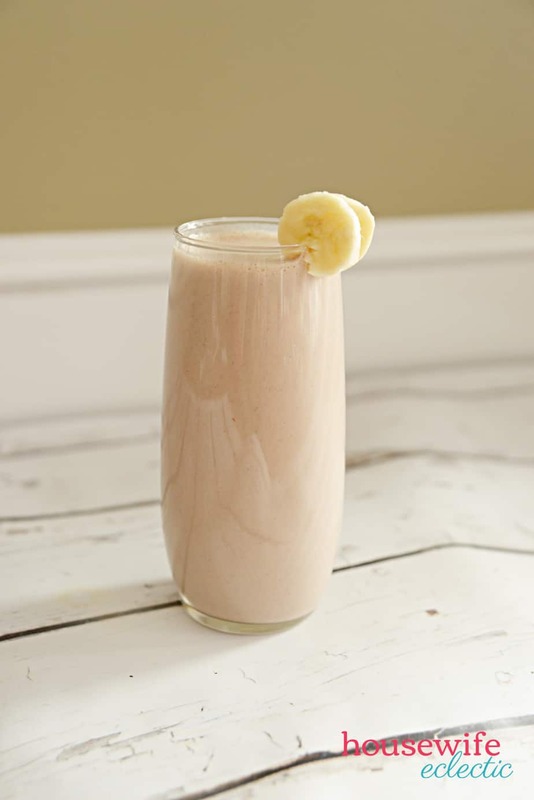 I make sure to have a protein smoothie similar to this one on the days I work out. Those are the days I know that my protein is lacking. This is definitely something I need to drink. I exercise every morning and I definitely need to start out with some protein. I know I would love these protein shake. There is something to be said about a good protein shake. Such a great alternative to the norm. The goal tracker is a really great idea. I love seeing a list and watching things get marked off, I bet this would be the same. I didn’t make New Years Resolutions, but I’d still enjoy this shake! It sounds tasty. I’ve never tried almond butter, so I’m curious! Chocolate is hard to resist and it’s good to have an alternative for it when you’re craving. I think this shake is great. It’s packed with everything you need and it satisfies your sweet tooth! I have a friend who swears by protein shakes. She is doing the 80 day obsessed program and she looks great! You had me at chocolate almond. YUM! I can’t wait to try this one out. Now this is my kind of shake! Chocolate and bananas? You betcha! Ooh I like this one. I am going to have to give this one a shot. Tracking the goals is a really effective method to ensure that one is working towards them. Just by tracking a disciplined approach is introduced. The almond protein shake seems really filling and full of health and energy. Oh my goodness, this sounds amazing. Kind of like an almond joy bar, minus the coconut. 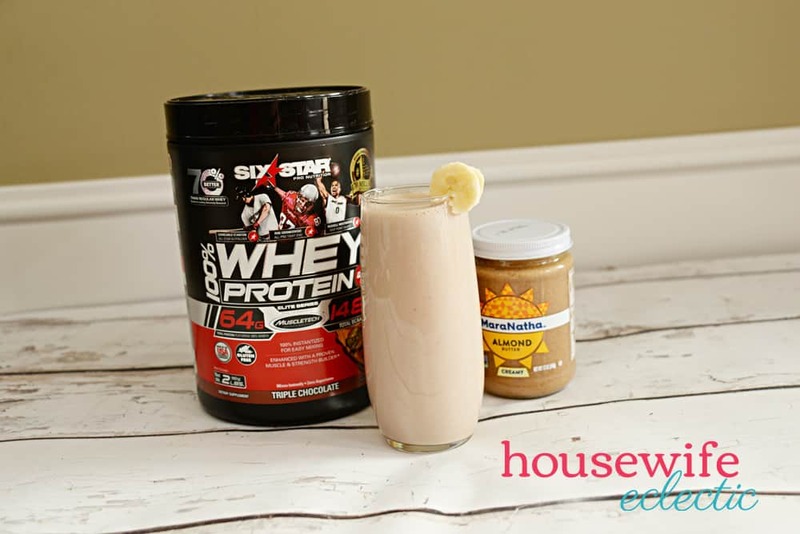 I’ll share the recipe with my SIL who makes one or more protein shakes daily. On the flip side, I didn’t make any resolutions this year. Unless making a resolution not to make resolutions, counts, lol.